Czech forward spent last season in the KHL after his two-game experience with the Avalanche. Now, he is back in Denver. Tomas Vincour signed a contract with the Colorado Avalanche. Details of the contract haven’t been revealed yet, but it is probably one-way deal as Vincour has never been interested in the AHL. 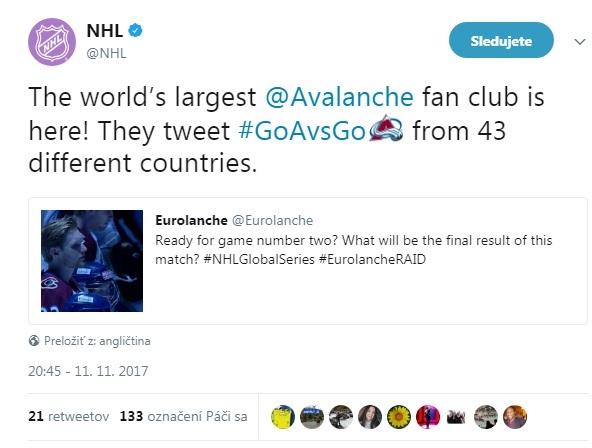 The fact there was no room for him on the Avalanche roster in the last season caused his departure from North America after approval from the organization. Vincour spent last season in the KHL as a member of the Avs organization. He played in 39 games and collected 11 points for Kazan Ak-Bars. At the beginning of the current season, he appeared in few games for his hometown team Brno of Czech elite league. „I got call from Avalanche’s general manager. He said they would like to sign me and they sent me a proposal next day. To be honest, I didn’t expect it. I was really surprised and I am looking forward. For now, I don’t know when I will have to leave country,“ said Vincour to the official website of his hometown team. Apparently, he will be missed as he scored four goals in just six games. According to quotes of local executive staff, his contribution will be missed, but everybody from the town wishes him success overseas. „I am sorry for all local fans. It was incredible here. Now, there is big chance to get in the NHL ahead of me. It came and I had to take it,“ concluded Vincour who has become second Czech player in the organization, joining Jan Hejda. Vincour was traded from Dallas Stars to Colorado Avalanche in 2013 for defenseman Cameron Gaunce. He played in 6 games for Lake Erie Monsters and in just 2 for the Avs with one assist in the NHL games. Tomas was drafted by Dallas Stars where he spent three seasons, travelling between first team and AHL.